We have been serving God in the Washington DC Metropolitan area since 1976. The Ethiopian Orthodox Tewahedo Church is one of the ancient churches established at the time of the Apostles. We are in the family of the Oriental Orthodox Churches. The Ethiopian nation was the first country in the world to accept Christianity as its national religion. Since the planting of the seeds of Christianity by the Apostles, our Faith has molded our history and culture. 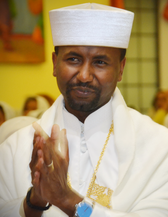 This website provides up-to-date information on a myriad of topics, including the Ethiopian church’s history, belief, creed, worship, doctrine, literature, church music, and art. Take a glimpse of some of the many wonderful things that we are doing; we certainly are a church that is on the move for God! We welcome you to come and worship with us every Sunday morning and again on Friday evenings for our Bible Study. We look forward to seeing you again and Thank you for visiting the Debre Genet MedhaneAlem Ethiopian Orthodox Tewahedo Church website. We are honored that you have taken the time to learn more about us. We are a Great Church with Great People, serving a Great God. May God, Most High, Bless you and lift up His face upon you.